It’s almost Thanksgiving here in the United States, that happy late autumn time when friends and families gather in the modern version of the traditional American harvest feast. • Buy Larousse Wine in hardcover from Amazon.com for $37.42, a 38 percent saving from its $60 list price. ● Buy Jancis Robinson’s The Oxford Companion to Wine from Amazon.com for $43.77, 33 percent off its $65 list price. Many of us will sit down to an oversize platter bearing a whole turkey, roasted golden-brown. More than 45 million turkeys annually give their lives to take their place in the traditional holiday feast, according to the National Turkey Federation. Take note, though, that if you click that link you’ll find an essay from Peter Singer urging us not to eat it. Not to worry, many families will turn to duck, goose, guinea hen, roast beef or lamb, a pizza or even an indulgent vegetarian or vegan feast in whose making no animals were harmed. All these options hold one thing in common, though: Thanksgiving dinner invites us to spread the table with a more sumptuous repast than most of us will enjoy on any other day of the year. 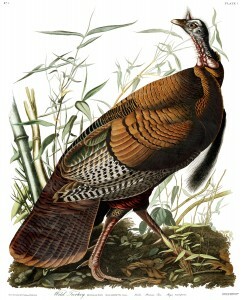 And, turkey or no, this poses a challenge to the wine enthusiast. When we consider the main dish plus the appetizing side dishes that load the holiday table – mashed potatoes and dressing, cranberry sauce, green-bean casserole and even candied sweet potatoes – the idea of finding one wine to match them all looms almost as pardon-the-expression insoluble a challenge as the storied universal solvent. One easy out involves forgetting the whole idea of a perfect food-wine match and simply pulling a special wine off your wine rack or out of your cellar and enjoying it in the spirit of Thanksgiving, sipping between courses and frankly deciding not to worry about a precise pairing. If you’re having a festive meal for a crowd, it’s also fun to open both red and white wines, giving your guests the option to choose one or the other or a little of both, as their taste buds dictate. But what specific wine? I’ve often invoked what I call the “cranberry sauce rule,” looking for a wine with a flavor profile similar to that of the traditional condiment for turkey: Cranberry sauce is fruity, tart, with only a touch of sweetness at the most; you’ll find no scent of oak, nor tannic astringency in your cranberries, whether you choose them whole or jellied. Quite a few wines have this flavor profile, not least Nouveau Beaujolais, the first French wine of the new vintage, which is being released into the marketplace this week and is widely available at wine shops for $10 to $15. It’s a good wine, not a great wine, but it will work well on your holiday table. Other grape varieties that fit the cranberry-sauce rule include Riesling, Gewurztraminer or Chenin Blanc if you’re in the mood for a white wine. If you want a red, a standard Beaujolais or a Zinfandel – the real red Zin, please! A sparkling wine affords a completely different approach, washing down the holiday fare and inspiring a festive table with the happy pop and fizz that attends its opening. Why not make Thanksgiving special with a real French Champagne? Saving the best for last, however, the king of holiday wine in my hierarchy is Pinot Noir, the grape that the comic movie Sideways made famous. Smooth, complex and balanced, with flavors of red fruit and earth and a texture that makes you think of velvet, an excellent Pinot Noir – choose among France’s Burgundy region, California’s cooler valleys or Oregon at your leisure – is a star in its own right and should go with just about anything on your table. Below you’ll find my tasting reports on two affordable Thanksgiving-friendly wines: A fruity, cranberry-scented Pinot Noir from the Loire Valley, and a popular American Gewurztraminer from Sonoma. Whatever you choose, I wish you a very happy Thanksgiving, and for our readers outside of the U.S., happy dining with family and friends whenever you get together. If you come up with a dinner wine that you particularly enjoy, I’d be delighted if you take a moment to let me know on our WineLovers Discussion Group forum or our WineLovers Facebook Page. I can find just about any information I want on Google, and read it on an e-reader. My old books are gathering dust. But I’ll make an exception for a good wine encyclopedia. They also make great gifts to wine-loving friends, to friends who are just discovering wine, and to friends who’d rather read books than dig into the Internet. My longtime favorite is Jancis Robinson’s The Oxford Companion to Wine. It’s now up to its fourth edition, and I’ve had them all on my shelf. It’s thorough and complete, with scores of wine experts contributing articles in their field of expertise. I wouldn’t be without it, and if you’re at all serious about wine, you probably need it too. But there’s another option that deserves its place in addition to, if not instead of, Oxford. Larousse Wine, a new update and translation of the classic French wine encyclopedia, was published just this month. Its seven-pound shipping weight makes it even more of a doorstop than Oxford’s 6.2 pounds, and if its 656 pages fall short of Oxford’s 912, there’s still plenty of good reading. The first third of the book offers a clear, well-written guide to enjoying wine, suitable for the newcomer and expert alike. The remainder features clear guides to the wines of the world. As you might expect from a French guide, about half of those 400 pages are devoted to France; the rest to all the other places wine is made. It’s good, though, and even the “lesser” wine regions get clear, informative summaries. 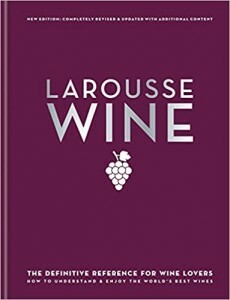 Buy Larousse Wine in hardcover from Amazon.com for $37.42, a 38 percent saving from its $60 list price. Buy Jancis Robinson’s The Oxford Companion to Wine from Amazon.com for $43.77, 33 percent off its $65 list price. You can also buy it as a Kindle e-book for $31.72, although this is the rare case of a book that I’d really rather pick up and enjoy in full-size, colorful hardcover. FOOD MATCH: Fat, rich fare works well to tame its forward fruit and sharp acidity, a good table wine for Thanksgiving and other winter feasts. WHEN TO DRINK: I don’t see this as a long-term ager. At its low-teens price, pick it up to enjoy with holiday feasts (and their leftovers), and then move on. I managed to grab a slightly better value than Wine-Searcher.com’s $13 average retail. In any case, it’s a good buy even up to the middle teens. For an info sheet, check the winery website in English, and page down briefly to find the Pinot Noir. 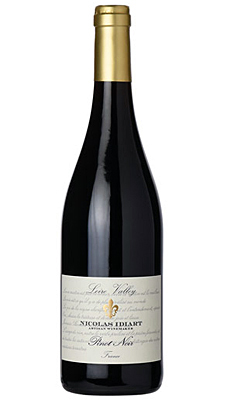 Find vendors and compare prices for Nicolas Idiart Loire Valley Pinot Noir on Wine-Searcher.com. FOOD MATCH: Gewurz is often proposed as a match for Asian fare, and Gundlach-Bundschu’s website reflects this wisdom. I think this is a wine-style urban legend, based on Gewurz translating to German as “spicy.” Asia is huge and diverse. No wine will match it all. Still, not-too-fiery stir-fries should work, especially with seafood, fish, chicken or pork. In Alsace, they love it with aromatic cheeses, and that will certainly work. And it goes without saying, of course, that it will work and play well on your Thanksgiving table. WHEN TO DRINK: There’s no big rush, but this isn’t really a wine meant for long aging, and its bouquet of aromatics isn’t likely to survive more than a few years in the cellar. Drink it up within a year or two, then buy the new vintage, which is already in the marketplace. Wine-Searcher.com lists a $20 average U.S. retail, but many vendors sell it for less, some as low as $16 or less, so it will pay to look around. It’s convenient to buy direct from the winery, but that price is not really competitive at $25 for a bottle, $270 for a case of 12. Here’s a brief info sheet on the Gundlach-Bundschu web page. 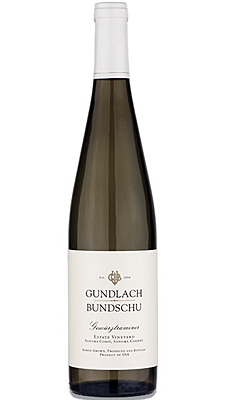 Find vendors and compare prices for Gundlach-Bundschu Sonoma Coast Estate Vineyard Dry Gewürztraminer on Wine-Searcher.com. Gundlach-Bundschu also sells the more recent 2016 vintage direct to the public for $25 a bottle, $270 for a case of 12.